Link Plate Height (h2): 0.228"
Link Plate Thickness (T): 0.030"
Single strand roller chain is the most common chain. Nitro roller chain products meets and exceeds ANSI specifications to offer top quality durable products. 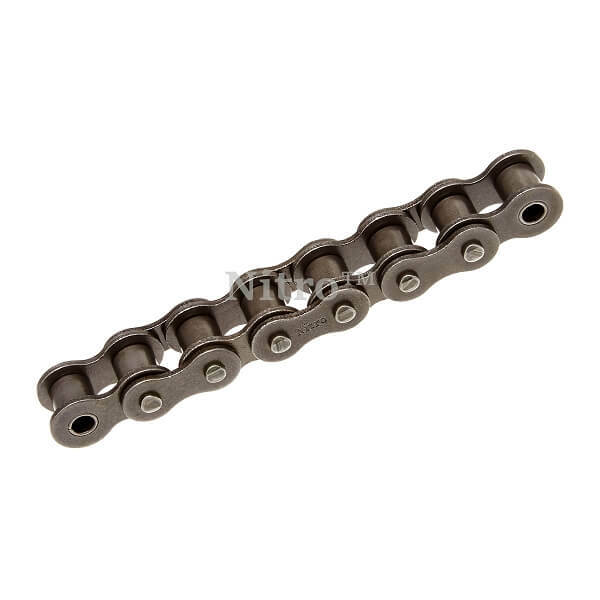 Single strand roller chain is used for a wide variety of applications such as industrial, agricultural, lawn and garden and much more. The drive chain on my 30+ year old Kangaroo stretched to the point the tensioner couldn't keep it on the gears. Cut off the length I needed and have enough left for several more replacements if necessary which is why I also bought two extra master links. Cost effective solution as original parts are no longer available. Keeps me walking the course. A: This sounds like #25 roller chain. To be certain, you can compare your chain dimensions to the dimensions we list on the product page. "kmo" is most likely the chain manufacturer.